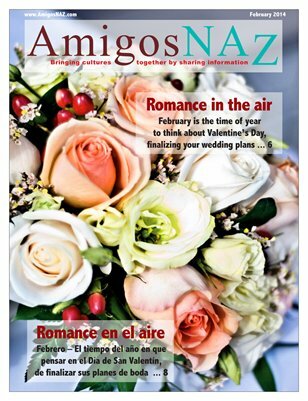 The February 2014 bilingual edition of AmigosNAZ opens with a cover story on finalizing both your Valentine's Day and upcoming wedding plans. The edition also includes a commentary on a change in SB1070 policy and the opportunity to open dialog between the Flagstaff Police Department and the Latino community; results of the City of Flagstaff's "2013 Citizen Survey"; a commentary by the Coconino County Public Health Services District on the Women, Infants and Children (WIC) program; a commentary by David Parra of AARP Arizona on the Affordable Care Act; tips on how to accommodate wedding guests, making your home safer for children, using a professional hair stylist for special events; and a listing of upcoming events in the region. All this and more brought to you by AmigosNAZ — Providing information for and about the vibrant Latino community in Northern Arizona.